In case you haven’t heard, Microsoft Live Search is now Bing. Microsoft released Bing on June 3, and it’s becoming a strong contender within the industry. 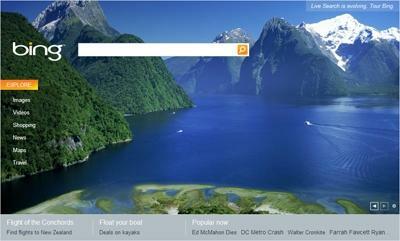 Bing offers comparison pricing, reviews, images, and more. Search Optics clients have presence on the new engine, and we will track Bing’s share of search volume and visitor conversions to ensure our clients receive optimal visibility. Search Optics is a digital marketing company that specializes in custom, integrated solutions with an emphasis on face-to-face client interaction. The company uses an uncommon blend of progressive technology and human interaction to turn virtual traffic into measurable results. Search Optics, which was founded in 1998, has corporate offices in San Diego, Detroit and Toronto, and field locations in major markets throughout the U.S. and Canada. For more information, please visit www.searchoptics.com. The post Search Optics Clients Presence on Bing appeared first on Search Optics Blog.